Manchester United – the next Liverpool? 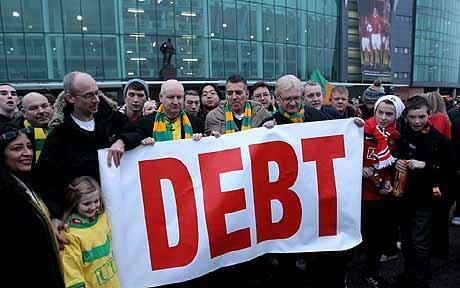 Manchester United today announced its results for the last financial year. It made an Operating Profit of £1oom – the first English club to do so. Turnover increased to £286m per annum. Manchester City’s turnover is £125m. The club has £165m in cash. Wages increased by 7% to £132m per annum. The level of debt has actually increased since last year. The club made an overall loss of £83.6m. This is the amount of money the club lost after paying the interest on its debt. The club must pay at least £40m every year in interest to its lenders. The club owes over £769m in total. So, do you think Manchester United could end up like Liverpool? Do you think it will have to sell more players in order to help its financial position?